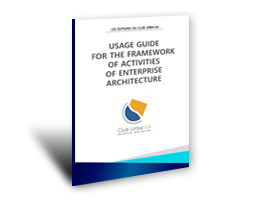 What is the Enterprise Architecture ? 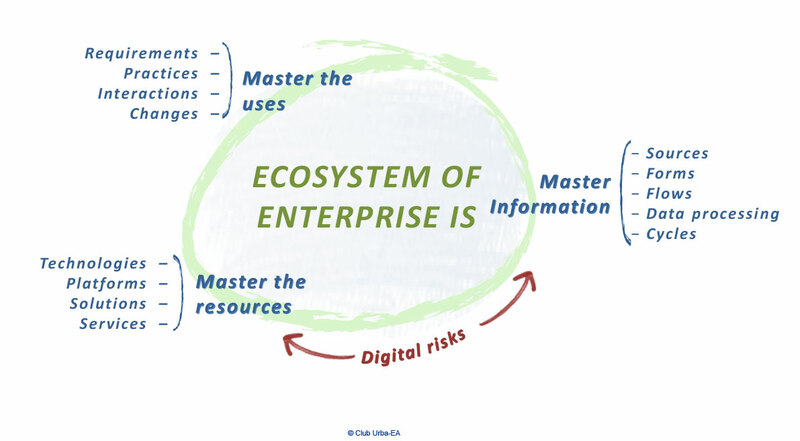 The Enterprise Architecture (EA) is a major lever for defining these IS transformations and to steer them. The diversity and complexity of transformations (including digital but not limited to it) conducted in parallel by public organizations enterprises reinforce the contribution of the EA. 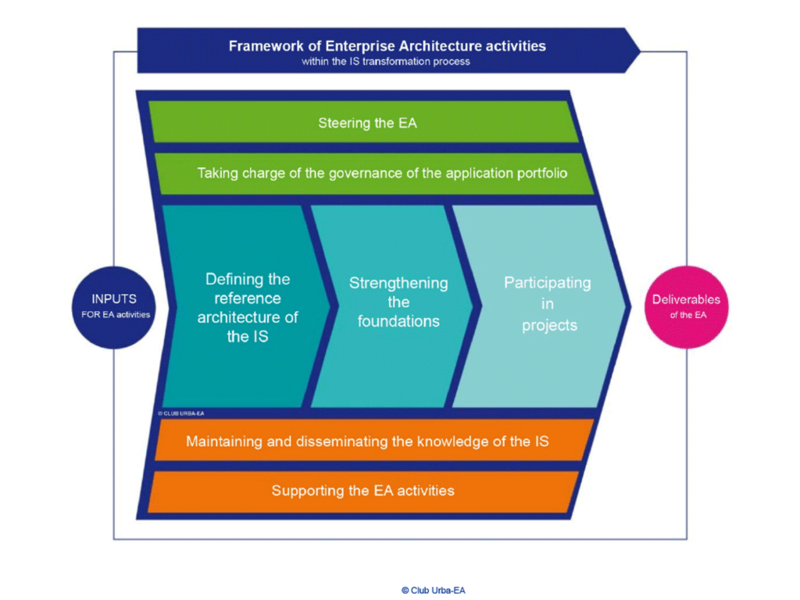 Capitalizing on the experience of its members, the Urba -EA Club has set the playground of Enterprise Architecture through a frame of its activities. The Enterprise Architecture (EA) found its origins in the late 80s in the US, where John Zachman provided a founding basis with the famous “framework” that bears his name. 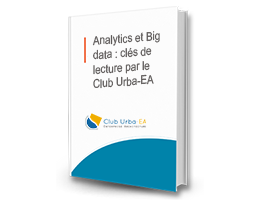 At the same time, the Enterprise Architecture expands in France through IS Urbanism. Since the early 2000s, these initiatives were implemented in many companies and French administrations. What does Enterprise Architecture brings ? We can classify EA contributions according to five major themes. For the company, the challenges of the digital transformation are numerous: optimization of operational performance, valorization of the information portfolio …, definition of new offers, definition of new activity areas, or even new business models to conquer new markets or to counter new competitors. The EA has an essential role to play in this new IS context by strengthening the mastering of key elements for the success of IS projects linked to the digital transformation. 1 – What is the Enterprise Architecture? Companies are experiencing major changes (new products, services, relationships with customers, regulations, mergers, internationalization, financial constraints …). Those changes affect both their business model, their strategy, their added value, their organizations, their modes of operation and also their relationship to the ecosystem (markets, customers, suppliers, …). And in this ” heckled ” context changes related to the digital opportunities are a key factor in the evolution of companies and their ecosystem. In response, companies conduct multiple and rapid changes in their environment, their strategy, their business, relationships with customers …. Information Systems (IS) is at the heart of these changes. Is part of the various processes and IS management repositories (governance process, project management, development, production, budget management ….) it enriches for everything related to the architecture and component on which it relies on. These activities are completed by steering activities and EA support activities. To ensure consistency between the different visions of the IS, the Enterprise Architecture must be based on a reference model. The business vision creates a model for the business world. Functional vision describes the functional architecture of the IS. It is an abstract vision of the information system that can move in a structured way from the business vision to the application vision and build an urbanized IS. The application vision describes the architecture and software and datas components that perform automated business functions & objects defined in the functional architecture. For each vision, concepts and IS elements are distributed over two levels, the treatment level or the “processes” in the broad sense, and the level of informations and datas. 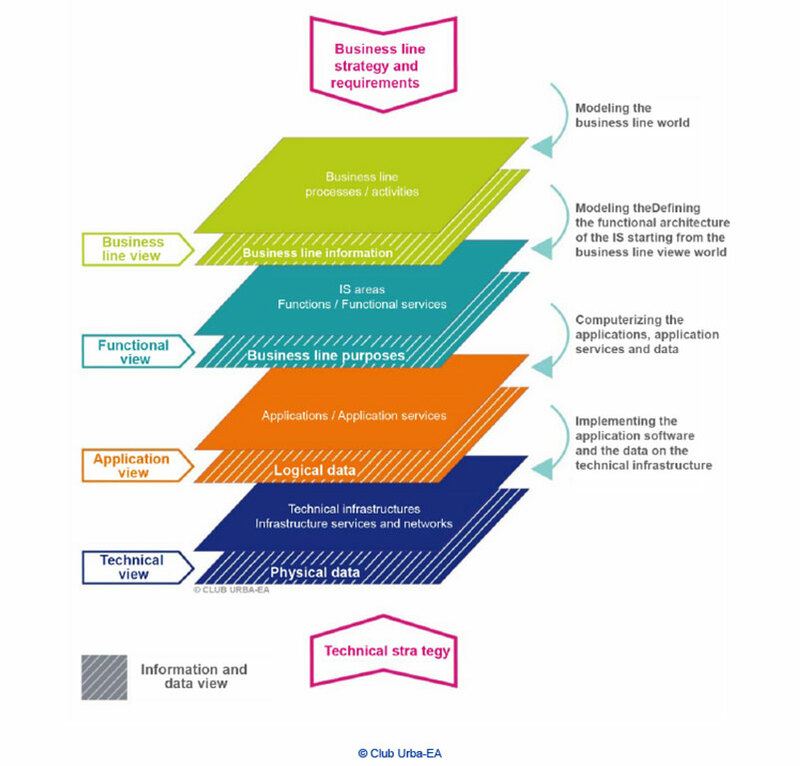 The different plans of information and data constitute a transverse way to the four visions, which the club calls the “information and data vision.” The goal of this vision is to highlight the different concepts and representations relating to data architecture from the business vision to the technical vision, and their necessary consistency. according to different views on the company from the strategic & business visions to more technical visions. In Anglo -Saxon countries, many actors will develop in the 90s and 2000s approaches and EA practices. Thus in 1998 the Open Group creates TOGAF, The Open Group Architecture Framework, based on the work done by the Department of Defense of the US government. TOGAF is currently in a 9.1version. At the same time, the Enterprise Architecture expands in France through IS city planning processes. Since the early 2000s, these initiatives were implemented in many companies and French administrations. 3 – What does Enterprise Architecture Brings? The EA significantly contributes to the emergence of IS structuring business issues and the definition of solutions to answer these problems. The AE increases the scalability of IS by reducing its complexity and provides more agility through the promotion of modular and standardized solutions. The EA optimizes the application portfolio by the rationalizations proposals, and by the obsolescence risk management. From the 2010s, the opening of the company to the digital economy is accelerating. The digital environment in which the company is evolving, is structured in three areas: the sovereign space on which the company has control, the extended space in which the direct partners of the company take place (customers, suppliers …) and the digital ecosystem, an open space that the company can use to expand its economic space, or to which the company confronts to master the risks of its business, including competitive risks. The IS is at the heart of all these issues. A new paradigm appears to IS: turning a productivity tool based on the sovereign IS into a business development tool open to the outside. And transversely to these topics, the mastery of associated digital risks. Processes disappear behind the customs, customer behavior and satisfaction of expectations. With digital processing, to meet the new uses appears new solutions and new IS, more agile, the Shorter lead changes, more or less intertwined with the heart of IS, sometimes out of ISD direct control. These new IS, often relying on new architectures must interface with existing IS as lasting elements of the new IS are intended to inter- operate with them. The EA plays a key role in facilitating interoperability. The choice of architecture and solutions made in the projects related to digital transformation must consider the integration and coherence with the needs of the IS heart ecosystem. In these areas, EA provides the framework for an overall management targets and trajectories of the transformation of IS.